With the three 17-year species of Magicicada from Brood II emerging this year in the eastern United States, the Staten Island Museum, co-founded by cicada expert William T. Davis (1862 – 1945), is focusing on making the most of this infrequent event. Their current temporary exhibition, "They're Baaack! Return of the 17-year Cicadas," along with planned workshops and nature walks, will inform visitors about these unique bugs in the coming months. This event happens to coincide with the our digitization of the cicada collection at the Staten Island Museum, which includes many specimens from previous emergences of Brood II, as well as the other broods of the 13 and 17-year cicadas. 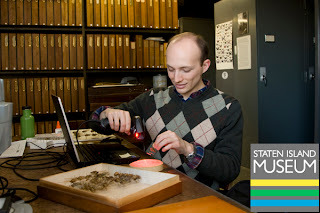 Posts on the Staten Island Museum's Tumblr and Blogspot sites offer information about local ecology and news about the museum, including their relation to the TTD.